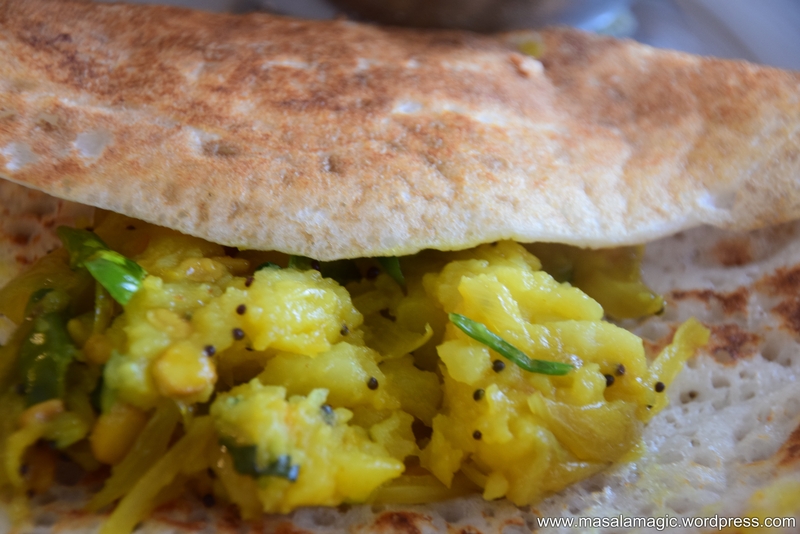 The two things that this Aloo subzi reminds me off every time I make it is – Mathura and Sai Baba. 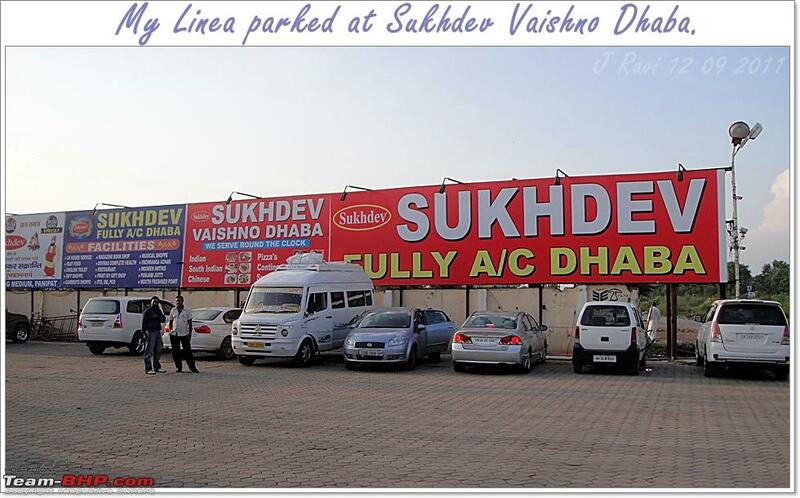 I feel blessed to have been able to live in the Delhi NCR area for a short few years. If you know India, then no two regions are the same. You begin to appreciate the diversity and culture of different parts of India only when you move out of home (read comfort zone). That said, South India and North India are like South and North pole. You will notice the diverse culture, languages, food, people etc. and truly wonder at how a land can be as eclectic and yet so beautifully different! I have had the good fortune of visiting Mathura a couple of times. Of course, Mathura not only stands for Sree Krishna and all the wonderful folklore and stories, Mathura also stands for its unique cuisine. If you have been to Mathura and missed the Kachori and Aloo Sabzi then you have not truly seen Mathura the way it should have been. Yummy hot kachoris dunked in a thin Potato gravy served in handmade little bowls, served on the streets of Mathura or even in the Mathura Railway station is something to die for! The next part of my story is a personal story I would like to share. Back in those days, every Thursday was “Fasting” day for me in an effort to please Sai Baba, whom I ardently admire and believe in for his simplicity and teachings. Of course, Sai Baba never asks his devotees to fast. But to me fasting or “Vrat” in Hindi, is more of a self control technique helping the “faster”/person to achieve a level of self control and abstinence from the most notorious of our senses which is “Taste”. So going back to my story, I would fast diligently every Thursday through the day with surviving on water and in the evening would stop by our local Sai Mandir on my way home. 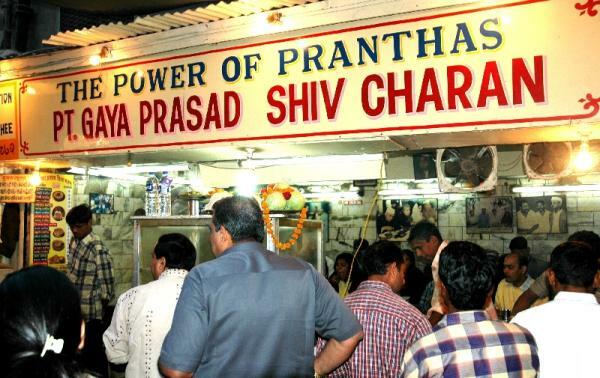 After the evening Aarti and prayers, i would stand in this long line to receive “Prasad”. And look forward to that prasad every thursday, since that was my only meal of the day and a way to break my fast. And every thursday, Sai Baba offered me 2 Puris with a generous helping of vrat waali “Aloo ki Sabzi” much like the Mathura waali Aloo ki sabzi. Trust me, after a long day, these two puris and the delicious aloo ki sabzi felt divine and worth the long wait through the day and in the line. So what is this special “Aloo ki sabzi all about”. 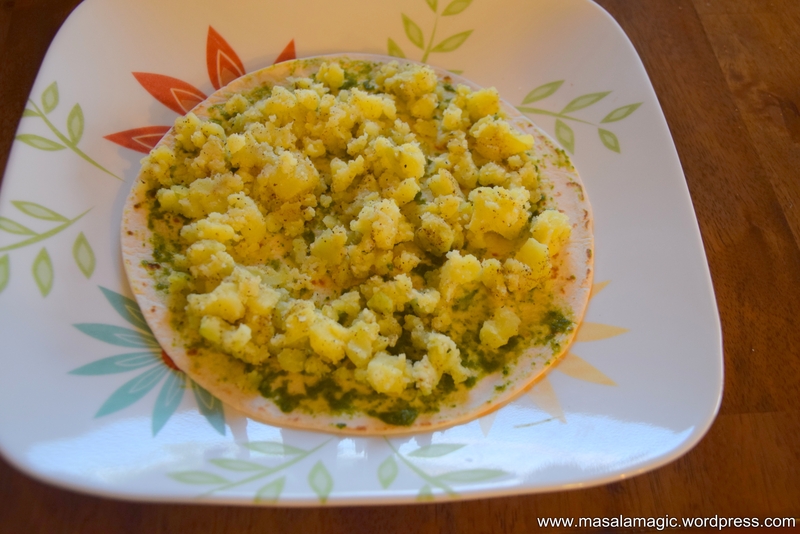 This is special because it is mostly made in North India surely around Navratri since it does not contain Onion or Garlic which are considered Rajasic foods according to Ayurveda causing an imbalance in your body. Combine all of the above and dry grind into a coarse powder in a mixer or food processor. 1. Wash and chop the Potatoes into halves. Pressure cook with enough water for about 2 whistles. Cool, peel and mash roughly. 2. The specialty of this dish is that it is typically made in a huge iron wok or kadai and cooked in low heat to perfection. The iron lends its a taste and flavor that is typical to this dish. Here I have used my cast iron pan, that i treasure and keep well seasoned. Heat oil in this iron pan. 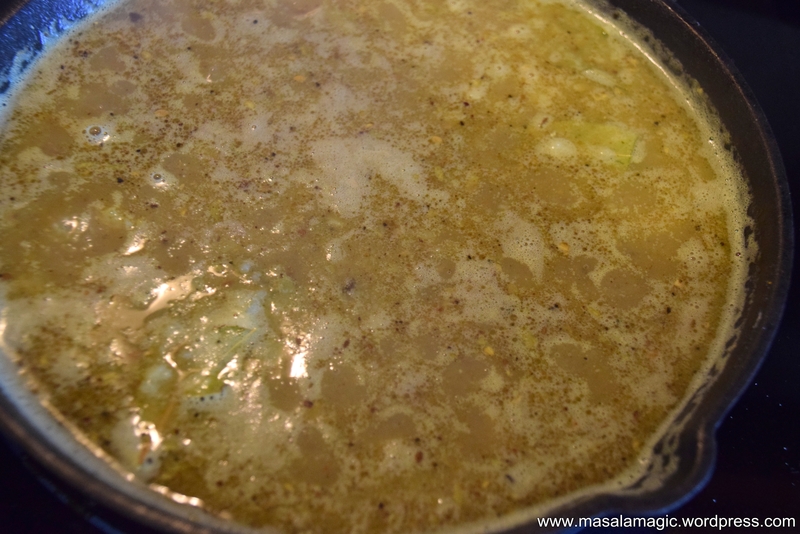 Season with hing and cumin seeds/jeera. 3. 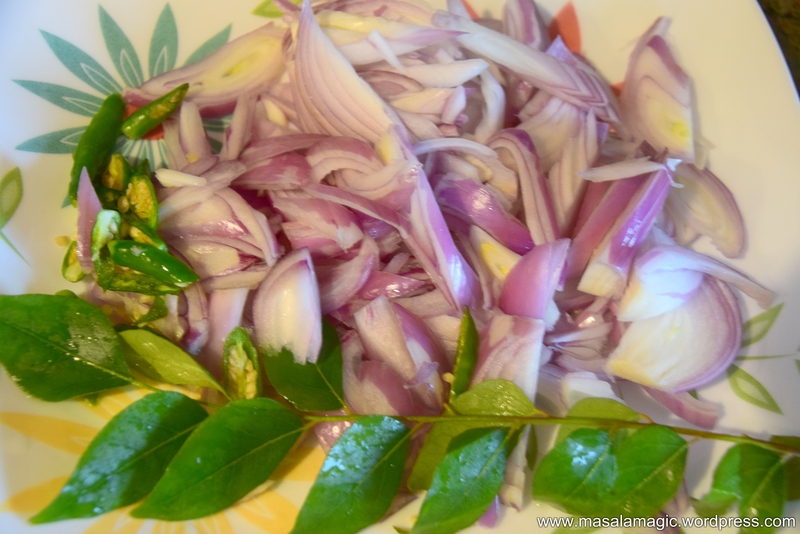 Add the bay leaves, fry for a minute. Then add the boiled, mashed potatoes. 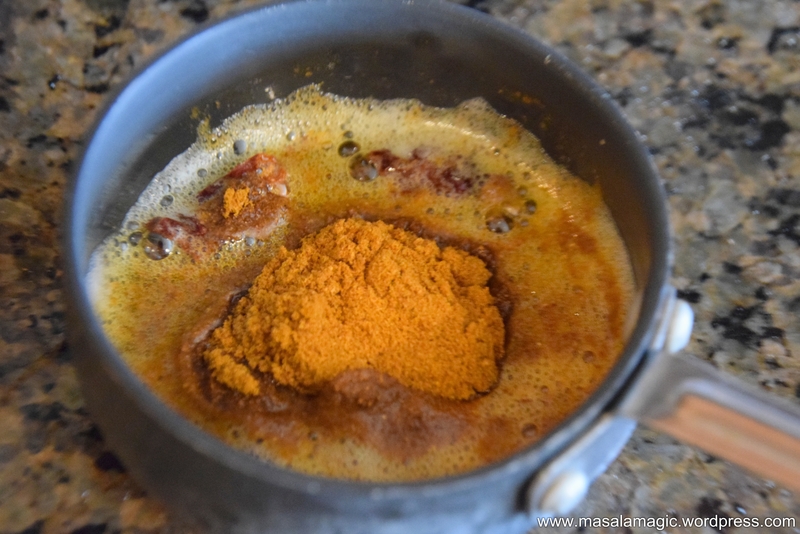 Add the turmeric powder and the ground garam masala powder. Mix well and cook for 3 to 5 minutes. 4. Add about 2 cups of water and salt to taste. Mix gently and evenly. 5. Allow to cook in low to medium flame in an open pan for about 10 minutes. Add more water if needed. The consistency of this curry is thin to semi thick. You may add water to bring it to the consistency you prefer. 6. 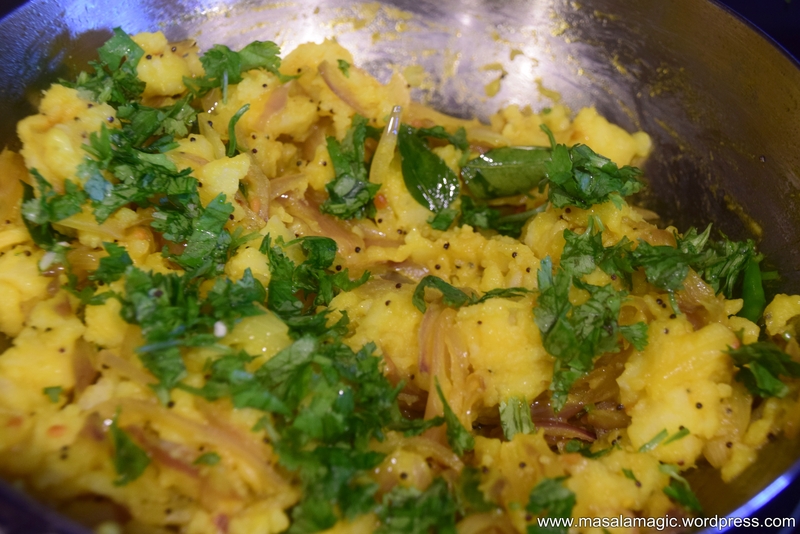 Add chopped cilantro/coriander leaves and mix well. 7. 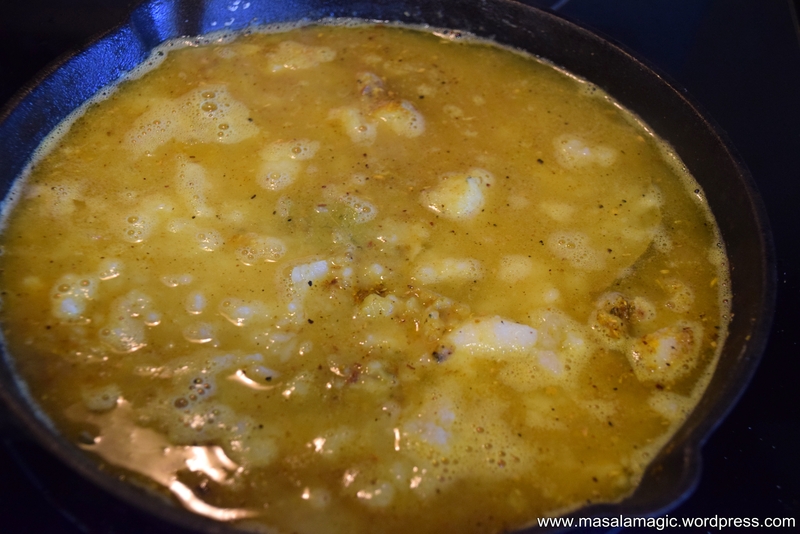 Meanwhile, in a small pan, heat the ghee for seasoning(tadka/chounk). 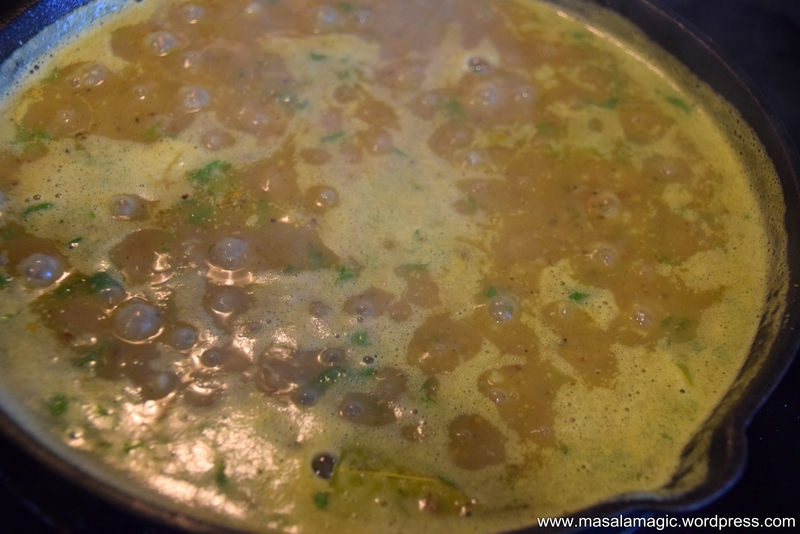 When the ghee is hot, add the cumin seeds, one dry red chilli and 1 to 1.5 tsp of the Red chilli and dhaniya powder. Mix well and pour on top of the boiling curry. 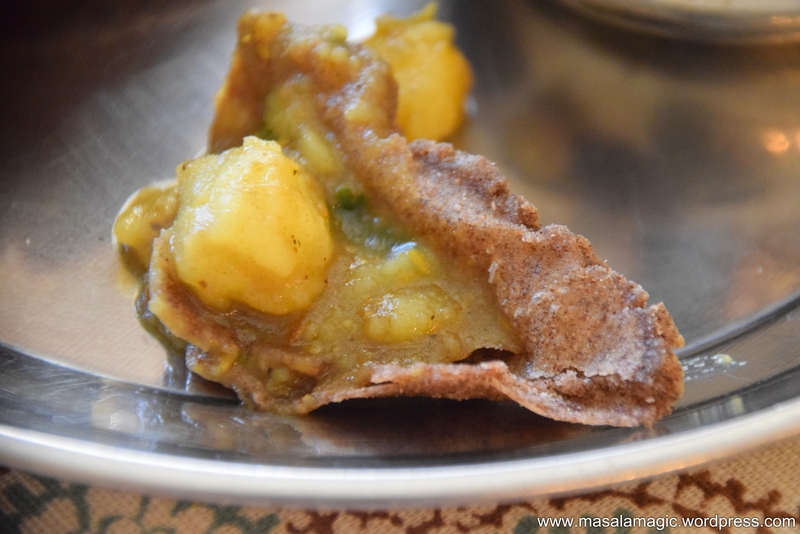 Here I have served this delicious Aloo ki sabzi with Nachni and Juwar ki Puris – Puris made with a mix of Nachni/ Ragi (Finger millet) and Juwar (Jowar/ Sorghum) Flours. Vrat waala food for Navratri is ready!! Just one more bite please!! Anyway you eat it, this is delicious! Hope you enjoyed my stories and post. Thank you for stopping by!! 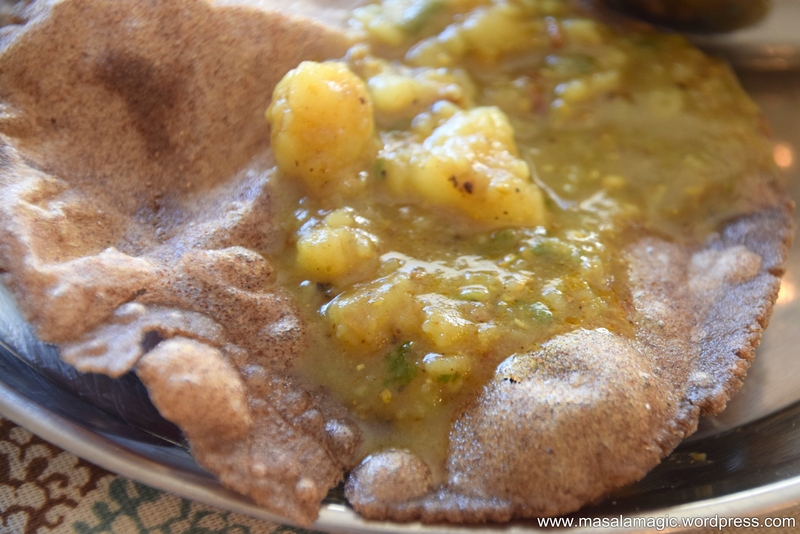 This South Indian variety of Potato Curry is quite famous as a stuffing inside a Masala Dosa. 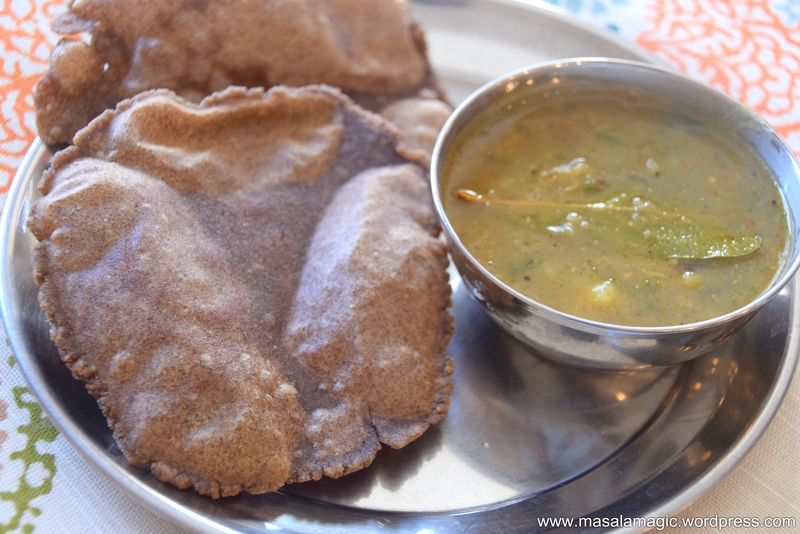 Depending on which part of South India you go, there are variations in how people make this dish. But by and large ingredients are similar and look and taste are similar. 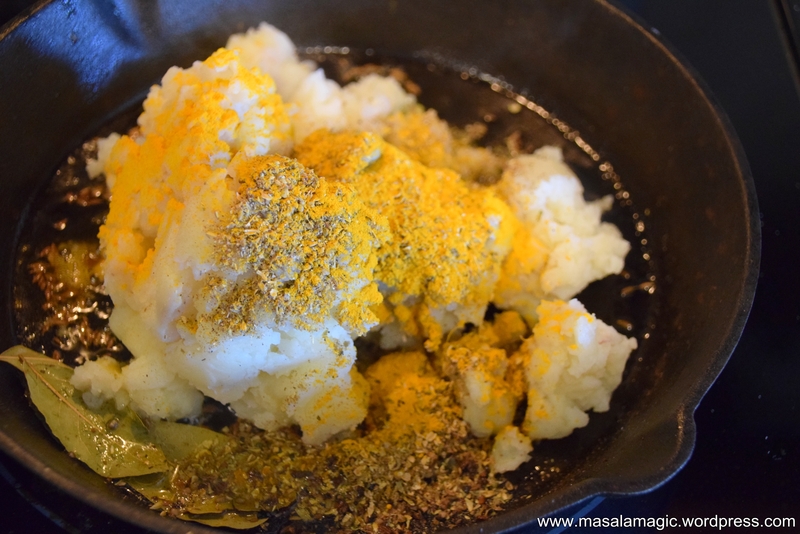 In Tamil Nadu, some people add fennel seeds to the seasoning and some people add besan/gram flour to the curry. 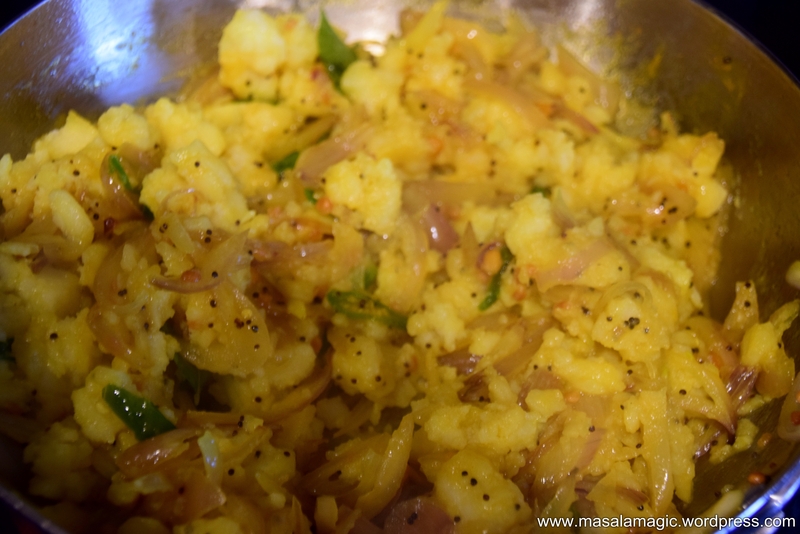 My recipe is how it is typically made in Karnataka. 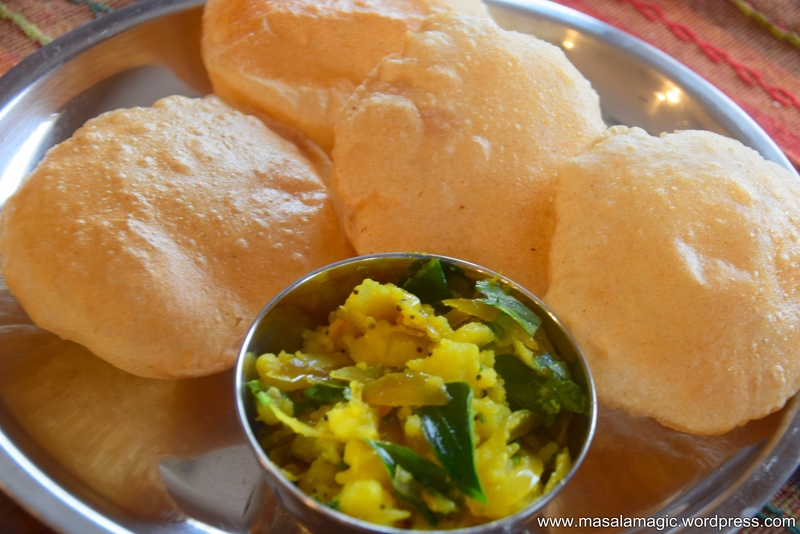 I learnt it how to make this from mom and this is one dish that I have not improvised or changed anything because it tastes just perfect that way. 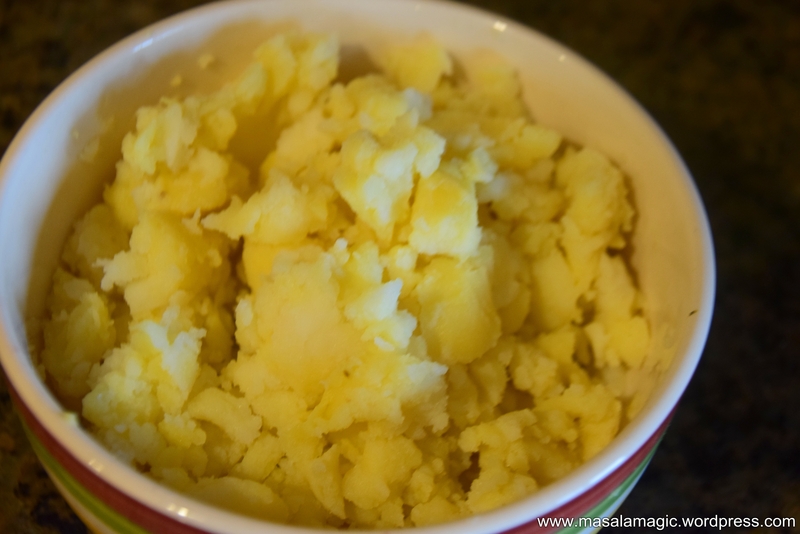 2 Large Potatoes – Wash, cut into large cubes and pressure cook for 1 or 2 whistles. Peel and mash roughly. 1. 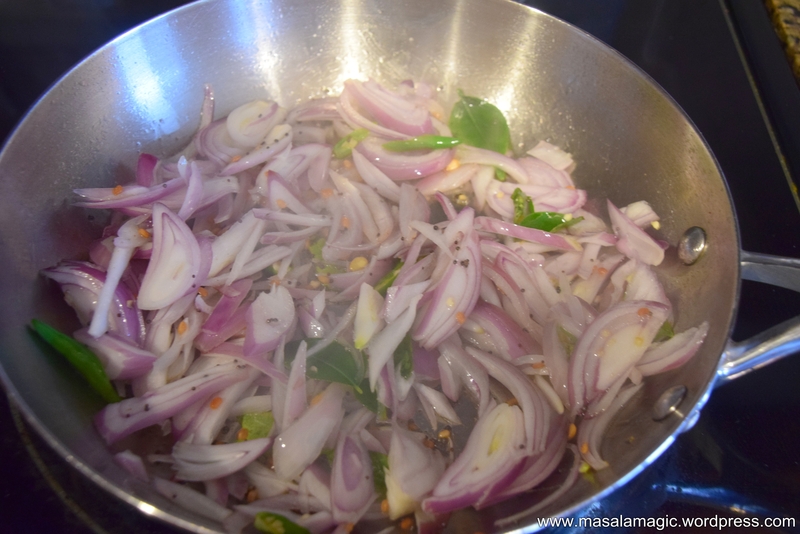 As mentioned above, chop the onions, chillies, grate the ginger and wash the curry leaves. 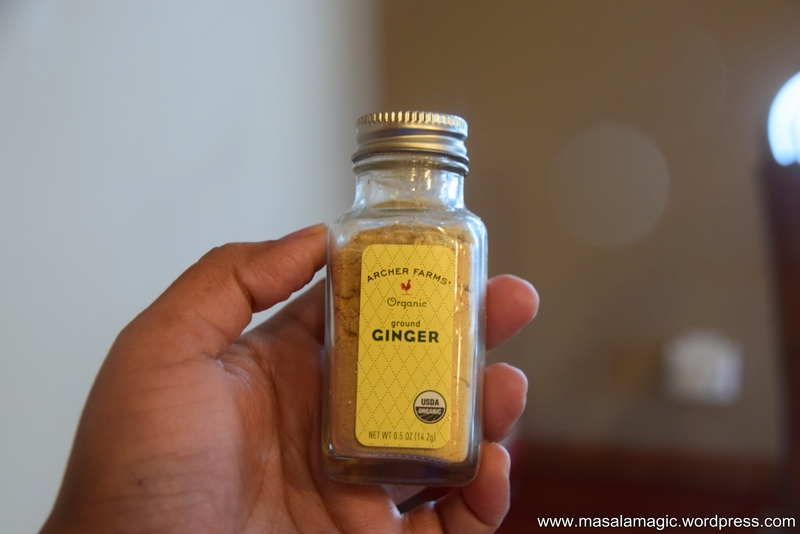 Here I ran out of ginger at home, so I always keep this ginger powder handy for occassions such as these. 2. Boil the potatoes, peel and mash roughly. Ensure that it is slightly lumpy i.e roughly mashed. If it is too pasty the curry wont taste good. 3. 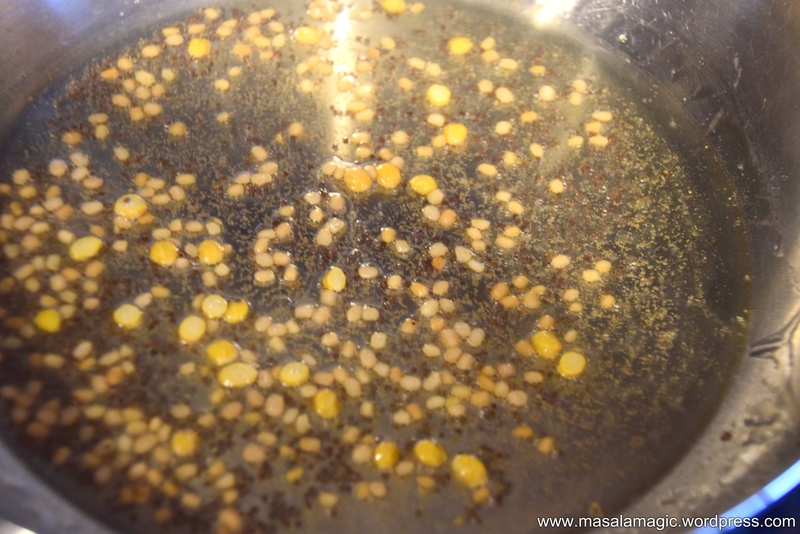 In a pan, heat the oil and season with mustard seeds, hing and the dals. Allow the dals to turn golden brown. 4. 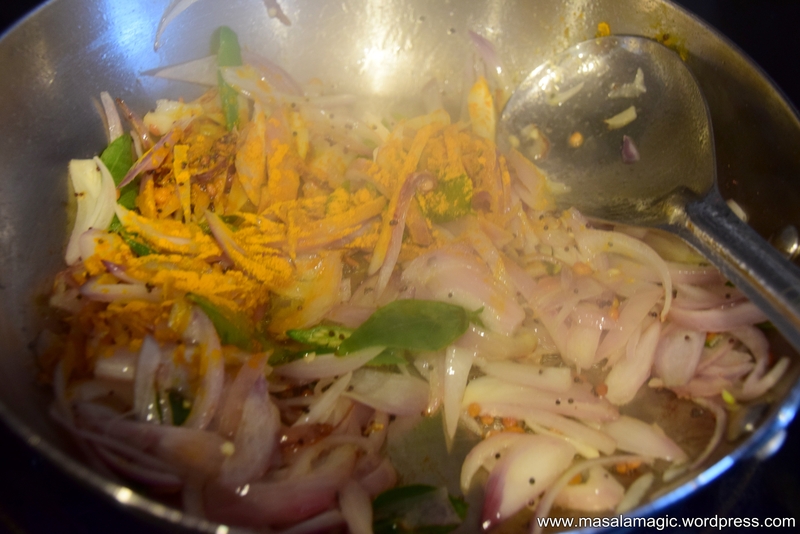 Then add the chopped onions, green chillies, grated ginger (in my case here ginger powder) and curry leaves. 5. 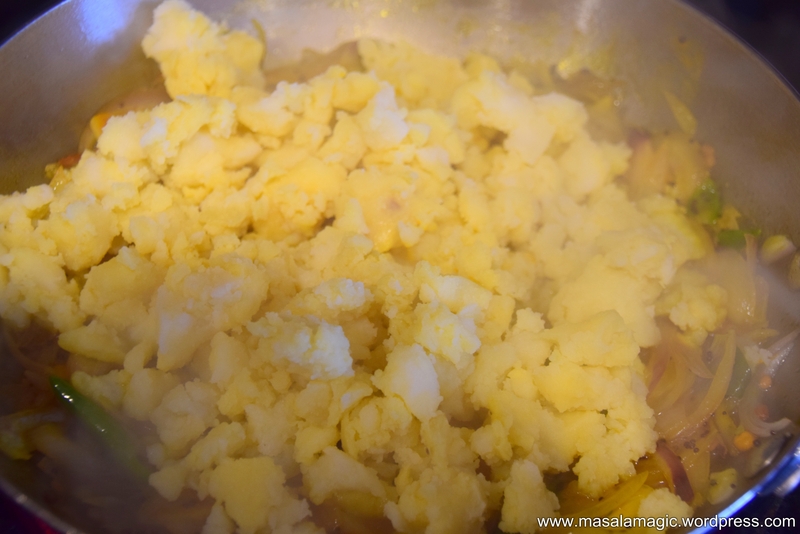 Add the turmeric powder and mix well. Saute for 3 to 5 minutes until the onions are transparent. 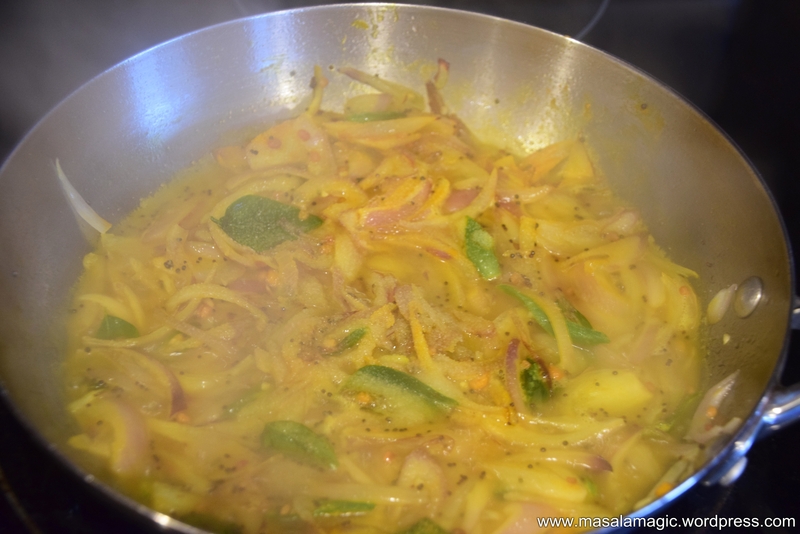 Dont allow the onions to brown, that changes the taste of the curry. 6. Add about 1/2 cup water and salt as needed. Bring to a boil and allow the water to almost evaporate. 7. Add the mashed potatoes and mix well. 8. Garnish with chopped cilantro and squeeze the lime onto the curry, mix well. 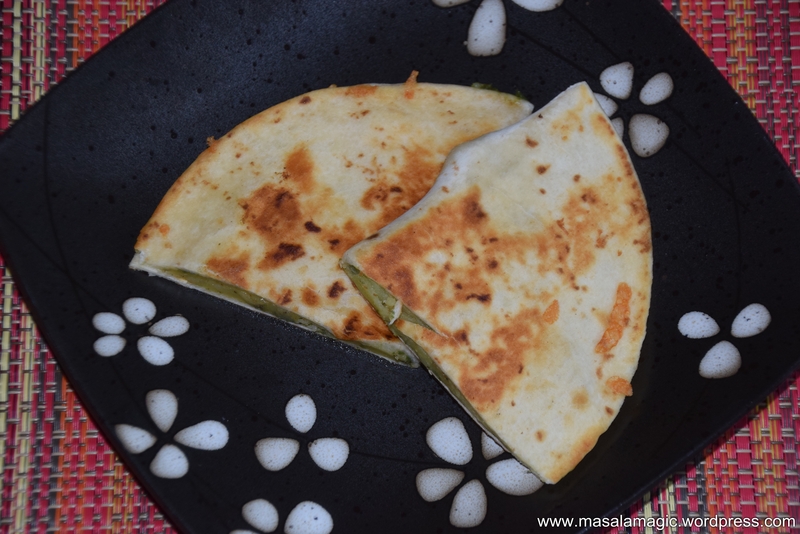 Quesadilla (pronouced as “keh” “sa” “di” “yah”) is a traditional Mexican flatbread sandwich made of tortillas and usually a cheese and bean or cheese and vegetable or cheese and meat or a plain cheese filling. Popular in the US and in Mexico and some other parts of Central and South America..this dish a kid friendly snack. Make it with lots of cheese and you cannot go wrong. To cater to a vegetarian palate at home and also to innovate with a slight Indian touch:-) I created what I call a Fusion Quesadilla this morning. This was our lunch for today, serve it with some fresh home made salsa or guacamole and you have a filling, fresh and tasty meal. 1. Boil the potatoes and mash as mentioned above. 2. 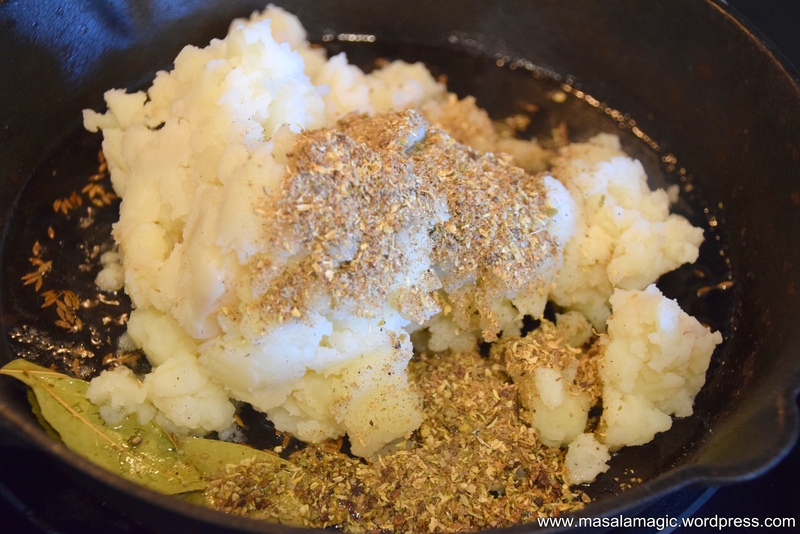 To the boiled potatoes add salt, pepper powder and 1/2 tsp butter and mix well. 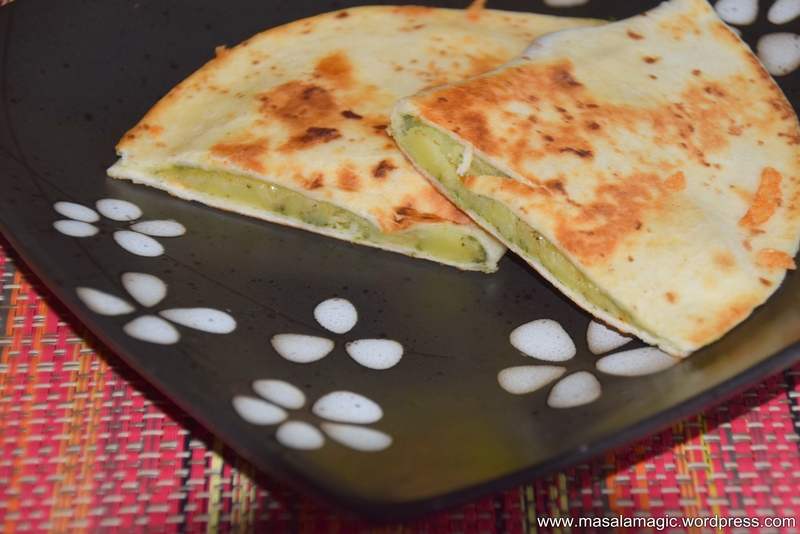 You may also add chaat masala or chilli powder if you like your quesadilla spicy. 6. 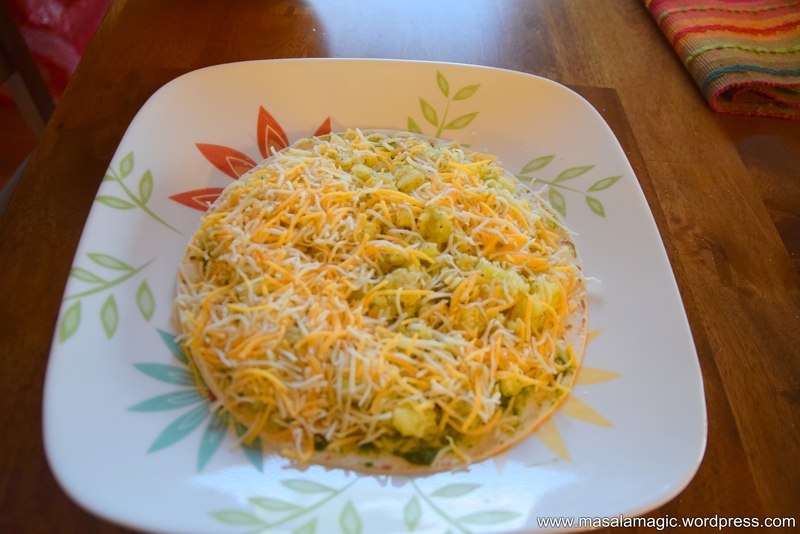 Brush some butter on the top of the tortilla and place carefully in a quesadilla maker. 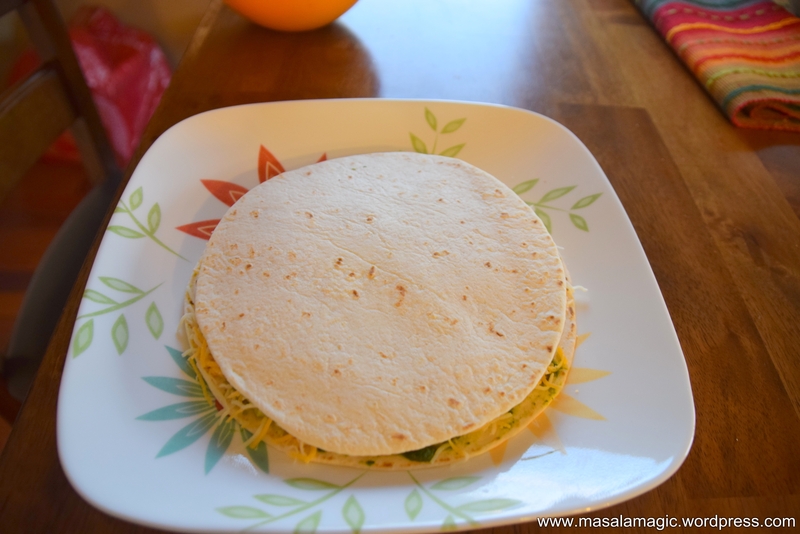 If you dont have a quesadilla maker, you can cook on a pan or tava like how you would a normal roti. Make sure you press gently on top and ensure the tortilla sticks. The cheese that melts will help in this. Flip over gently and roast the other side too. Apply butter as needed. 7. Cut into 4 wedges and serve hot. This is simple dish that the kids will love. Before I even begin this post..I will tell you that I love my parantha!! Does not matter that it is a huge gastronomic disaster! but it has to be eaten right..loaded with butter and filled with a filling of your choice, served with chole or aloo sabji, curd and a pickle and finally washed off wiht some lassi or shikanji!! 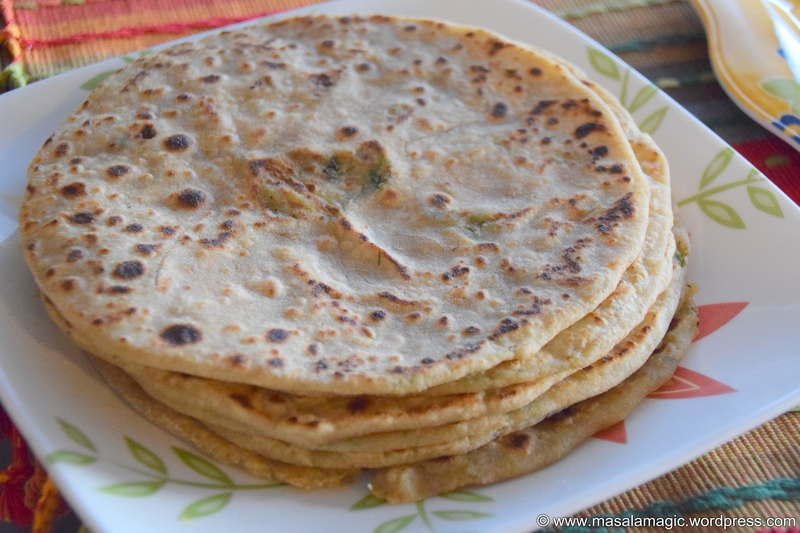 There is my favorite – the gobi parantha – just love the tender cauliflower grated and flavored with seasoning, Paneer Parantha – again yet another favorite, love the soft paneer / cheese grated and flavored with all desi masalas. Next in line the Aloo parantha..soft aloo mashed, flavored and filled inside soft layer of bread!! Its heaven on earth people..
Of course innovation has outdone itself and there are mixed vegetable paranthas, kheema paranthas for the non vegetarians, kaju or mixed nuts paranthas, khoya paranthas, fruit paranthas etc. 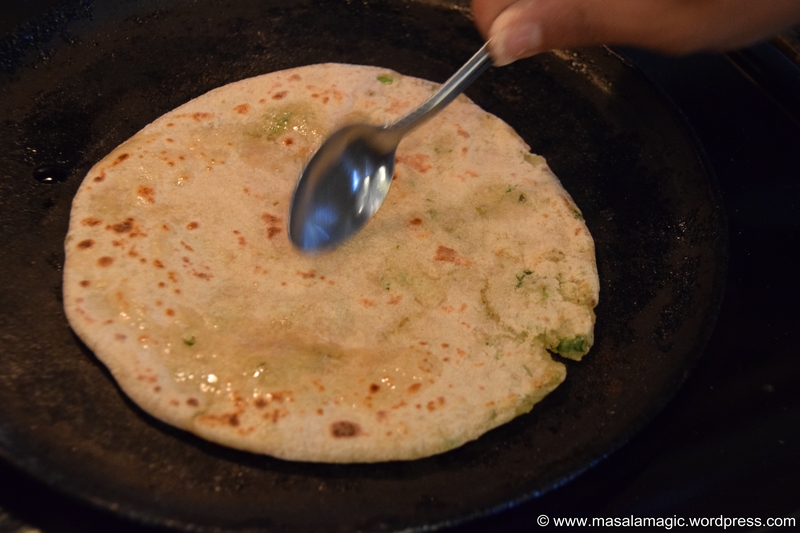 If you are in Delhi, dont miss the Paranthe wali gali in Old Delhi – Chandni Chowk!! I just love visiting the Chandi Chowk area – the filth or the crowd does not bother me. Just enjoying the sounds and the awesome paranthas, not to mention the other delicious food is an experience of a lifetime! 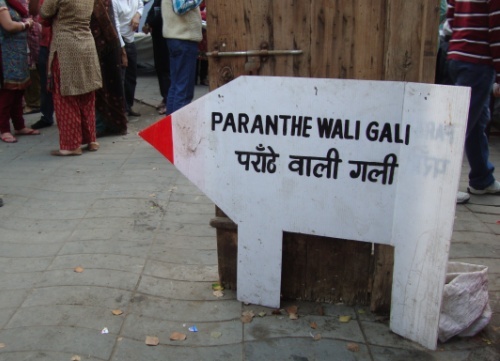 Learn more about Paranthe wali gali here. 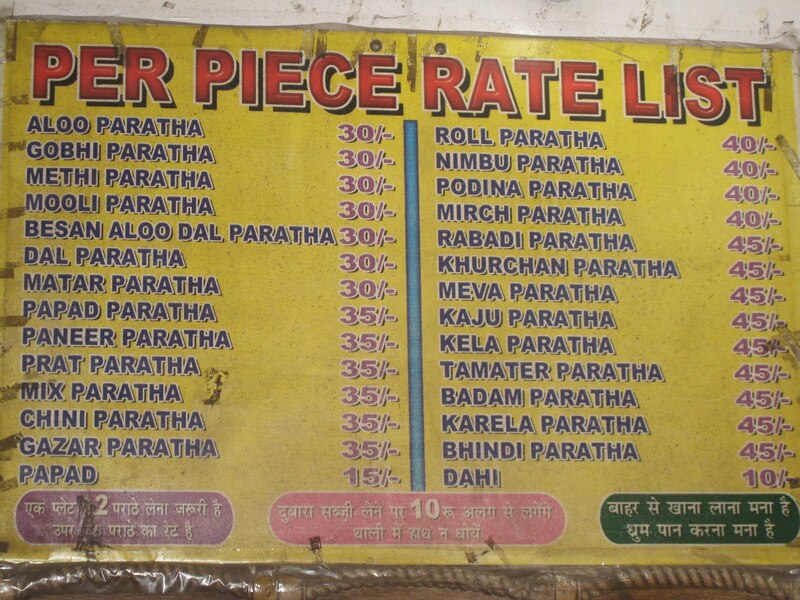 A Parantha experience is also great when you stop at the millions of dhabas on the roadside on your way from Delhi to Agra or Delhi to Jaipur!! 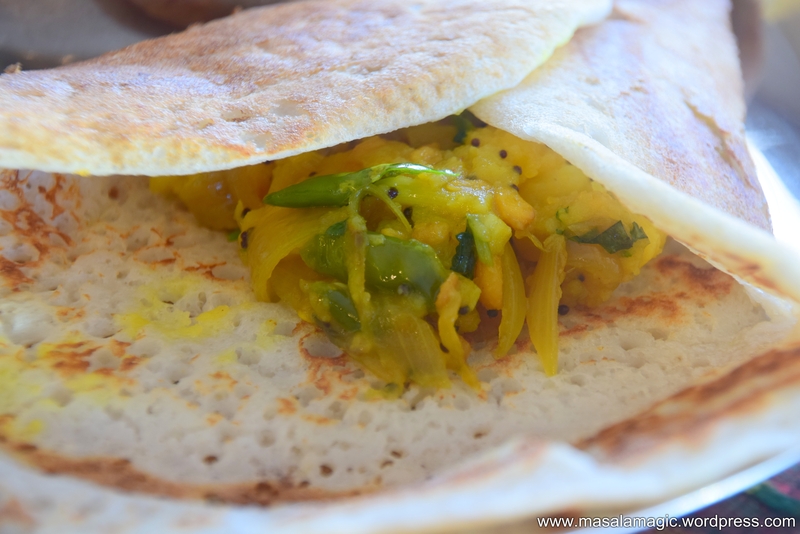 Freshly made and awesome tasting these paranthas are to die for!! Add the salt to the whole wheat flour. Mix well. Add warm water the flour slowly and mix well until evenly mixed. MAke sure the batter is not hard or too soft. 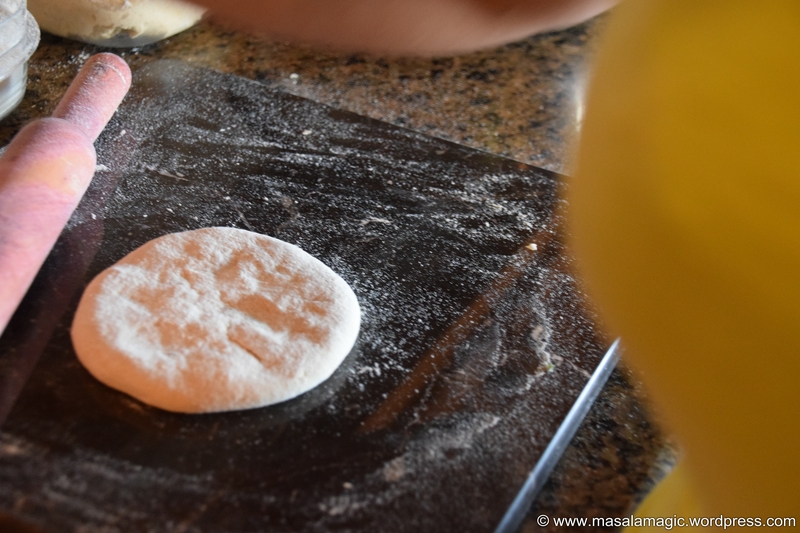 Knead well into a soft pliable dough, soft enough to roll it out. 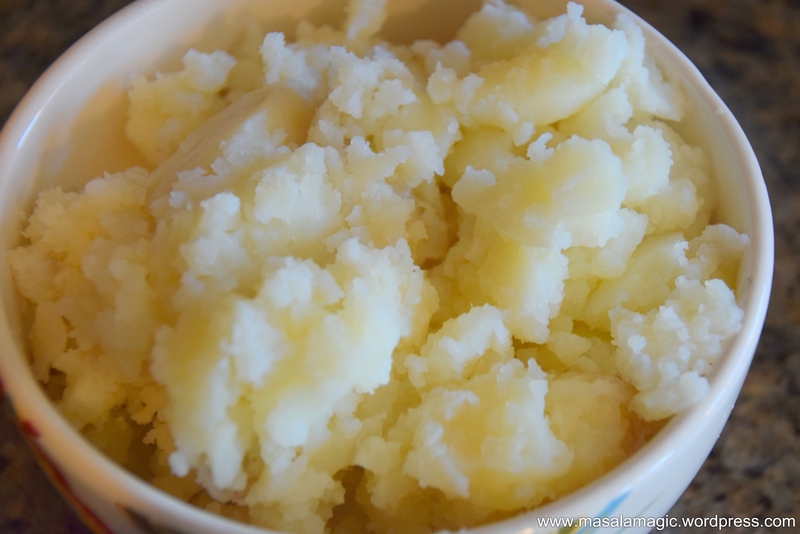 4 large Potatoes – Wash, chop into halves and Boil in pressure cooker for 1 whistle. Peel, mash and keep aside. Add all fo the above to the mashed potatoes and mix well. 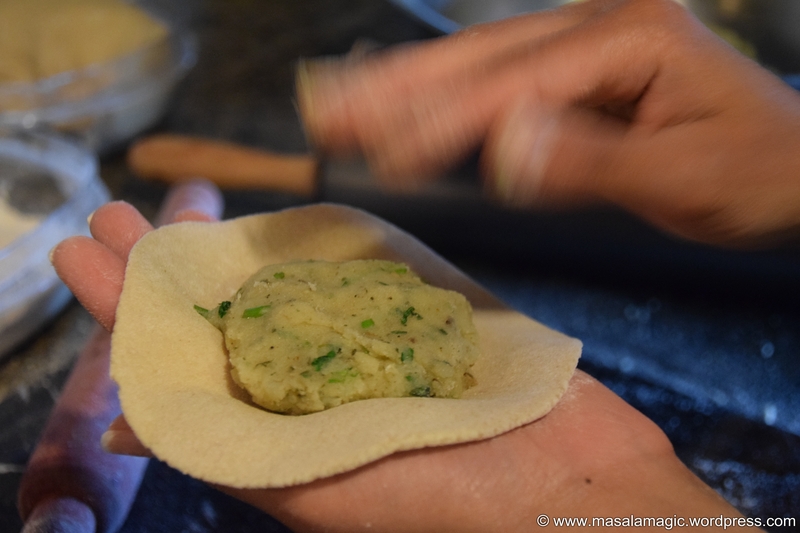 Keep the potato mixture aside to be filled into the paranthas. 1. 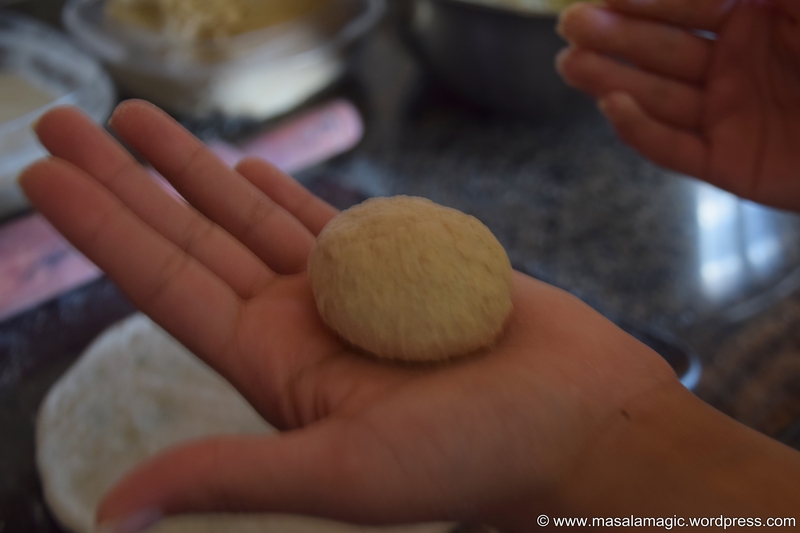 Take a golf ball sized dough and roll it in your hands until soft and shaped into a round ball. 2. 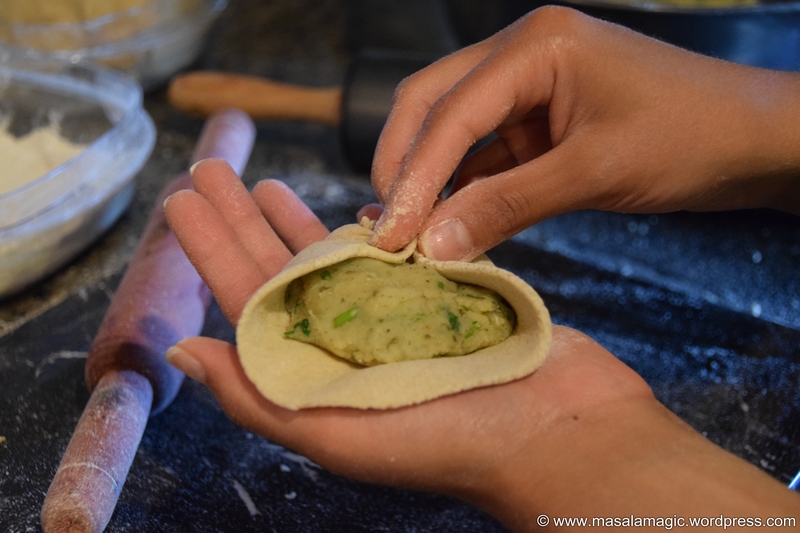 Roll into a small circular roti. 3. Take a golf ball sized potato mixture. Place in between the circular roti. 4. 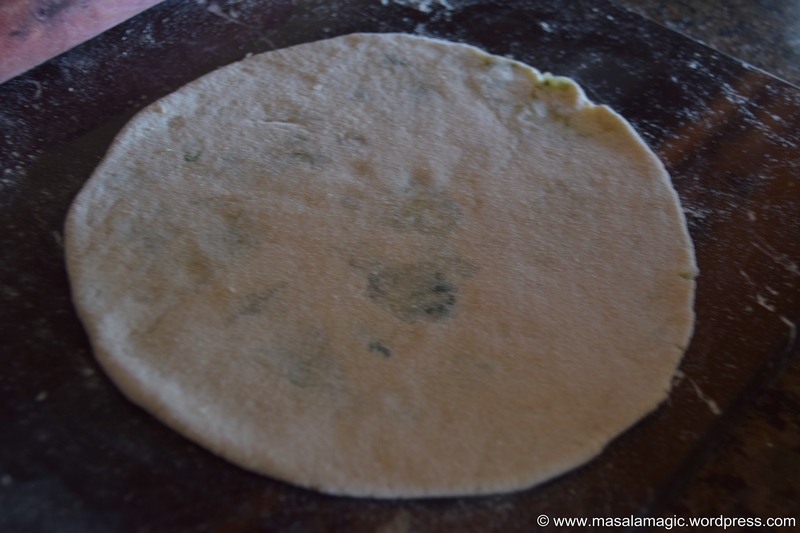 Bring the ends of the roti together in the middle to cover the potato mixture. Ensure it is well closed. 5. 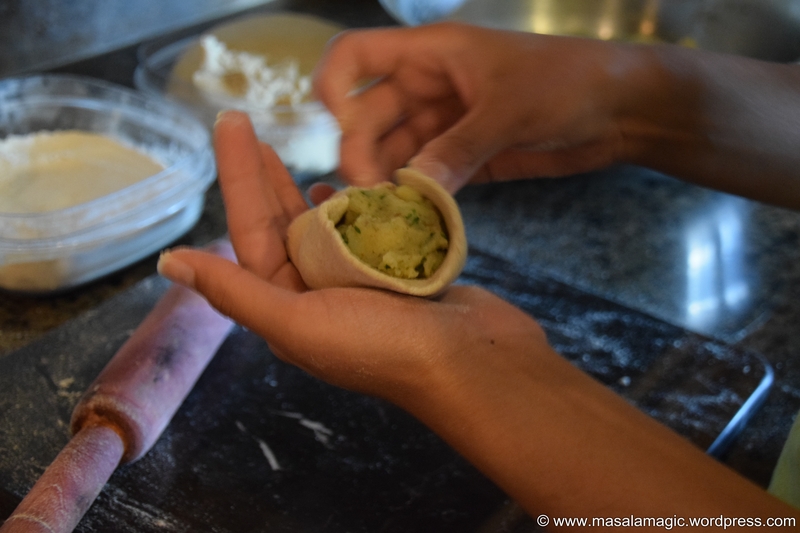 Dust it with some dry wheat flour and roll it out into a thick paranta. 6. 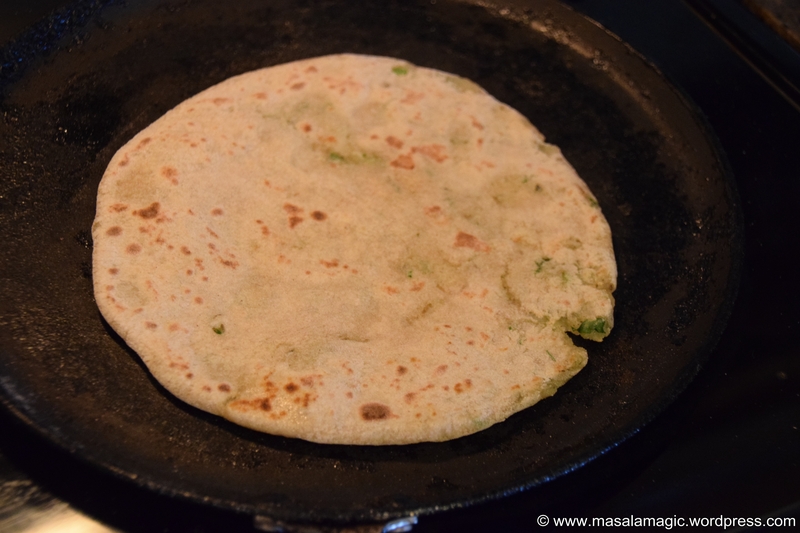 Roast on a hot griddle or tava with some oil or ghee on both sides. 7. Flip over and roast the other side as well until golden brown. 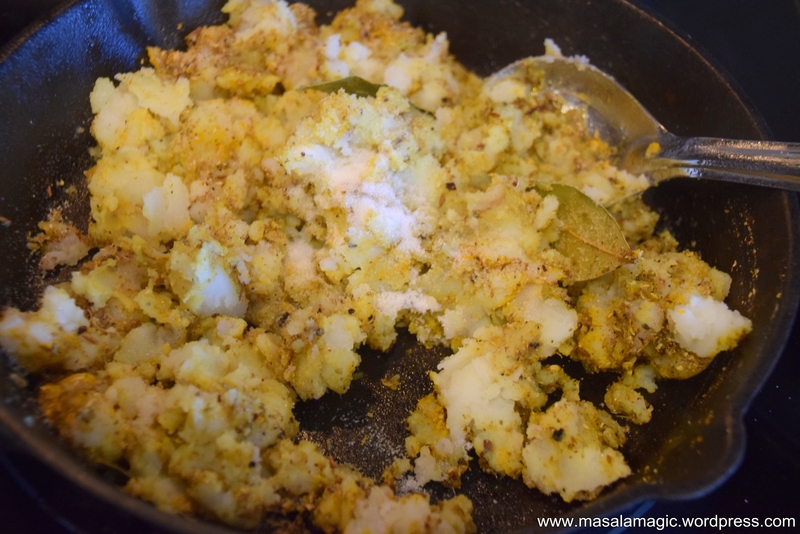 8 .Serve hot with curd, pickle and sabji of your choice. 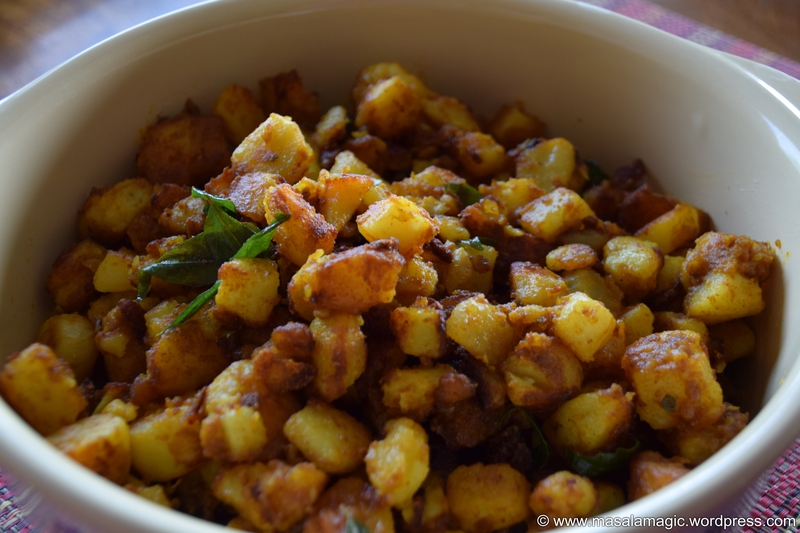 Today’s quick recipe is a very traditional Indian style Potato Fry recipe. 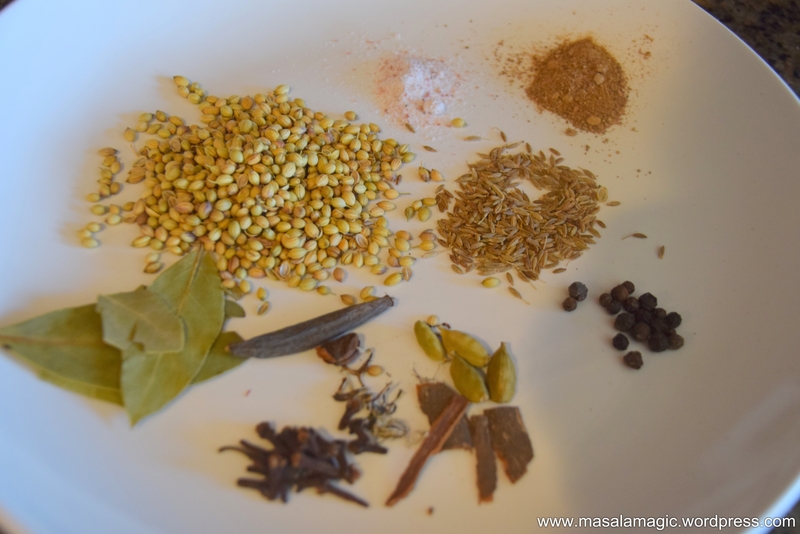 This typically tastes great with rice and sambar or rice and dal. 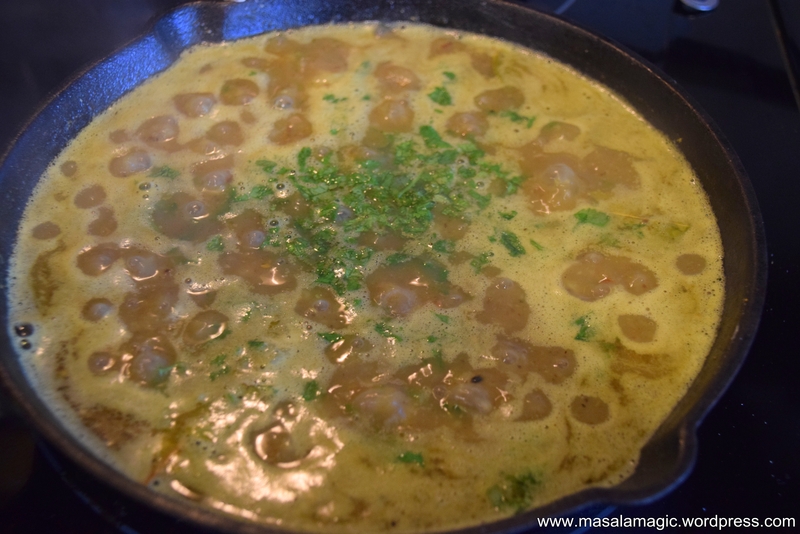 Pretty much every Indian household makes potato fry or potato gravy – and there are numerous recipes for this humble dish. And every potato dish tastes different – usually the curry powder or chilli powder used gives it the distinguishing taste..
1. Wash and chop the potatoes into halves. Pressure cook with the peel for 1 whistle. Peel and chop into large cubes. Alternatively, you can peel the potatoes and boil wiht plenty of water on stove top until cooked. Drain and keep the boiled potatoes aside. 2. 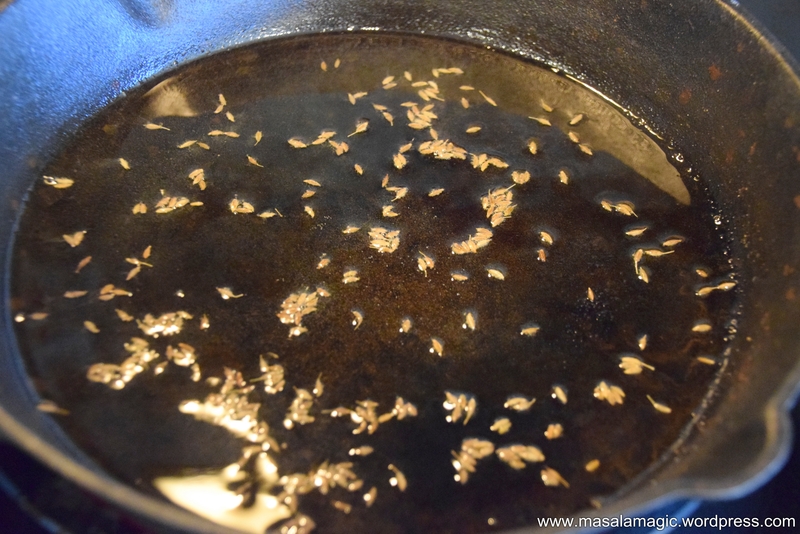 In a saute pan, heat 3 tbsp oil. 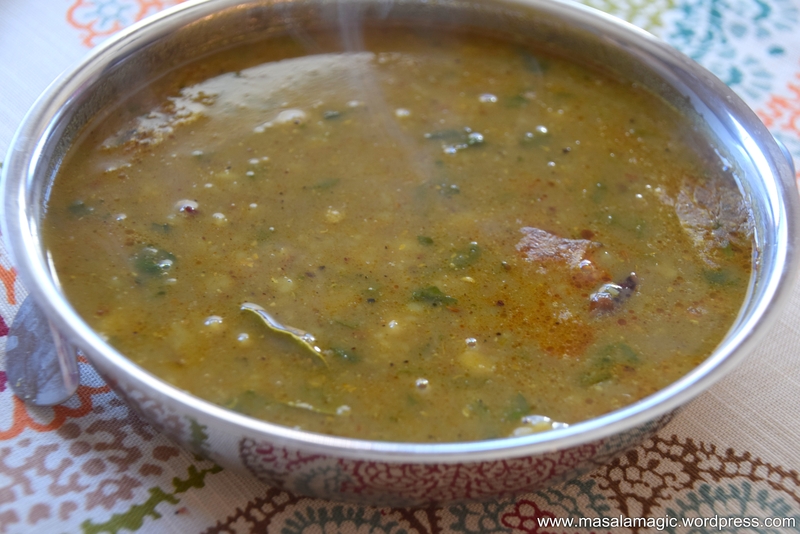 You can season with mustard seeds and urad dal if you wish at this point. 3. Add the hing and curry leaves. 4. Add the boiled potatoes and all the powders. 5. Add salt and mix well. Mix gently using a spatula and ensure the potatoes do not break. 7. Add crushed garlic at the end and saute for 2 more minutes. 8. 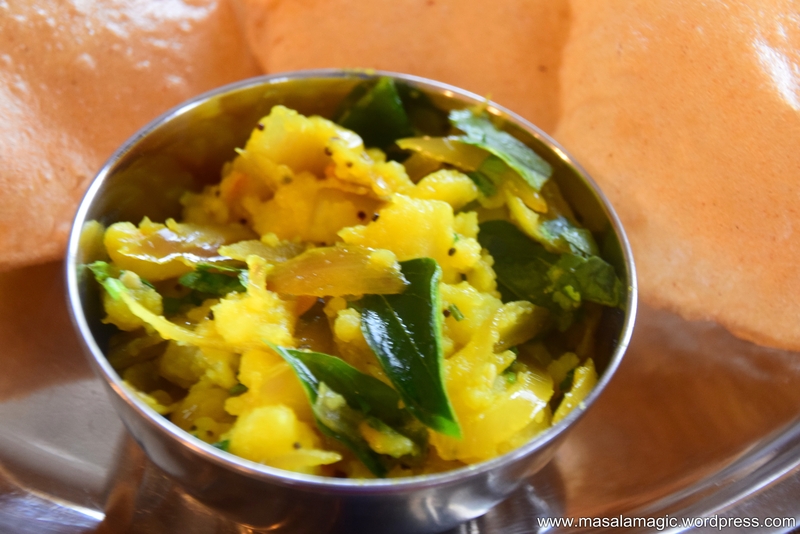 Serve hot as a side to roti or rice.